Work to Ban Source of Income Discrimination! Right now House Bill (HB) 1633 and Senate Bill (SB) 5407 are making their way through committees in the House & Senate, if passed, these bills will ban source of income discrimination in the state of Washington! These bills will prohibit landlords from refusing to rent to an applicant and from evicting tenants based on the source of income of an otherwise eligible applicant or tenant. This will protect people who use social security, child support, SSI, Section 8, & HEN to pay their rent. Hear from Section 8 Tenants who faced discrimination based on their source of income in the video below and click here to read more about this victory in Renton. HB 1633 had public hearing in the House Committee on February 7th and it is scheduled for executive session in the House Committee on February 16th! Call your elected official’s office directly. p.s. share this with someone you know from another area of Washington State so they can contact their representatives too! Click here to use the Washington Low Income Housing Alliance bill tracker to track the progress of bills that affect housing & homelessness! 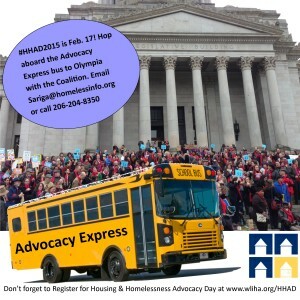 Reflections on a rousing 2015 Housing & Homelessness Advocacy Day! On February 17, 2015, 650 of our closest friends and allies from all across the state of Washington gathered in Olympia at Housing and Homelessness Advocacy Day to speak up for affordable housing and an end to homelessness. 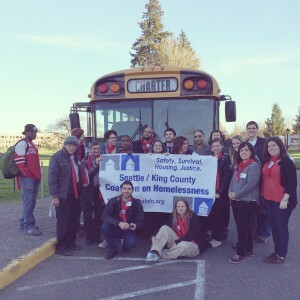 Driven by an enthusiastic and cheerful bus driver, we headed to Olympia at 7:15 a.m. with 30 Coalition members and friends – service providers, clients, residents, guests, and others. For some, it was their first time to Olympia and an introduction to advocacy in action. Others were veterans of HHAD. Everyone on the Advocacy Express bus was rearin’ and ready to make a difference, and that they did! The Coalition’s Advocacy Express bus rolled up right on time to the morning activities, and found inspiration from the first of many speakers that day. Housing Alliance staff, State legislators, and superstar Real Change vendor Pam Russell all spoke how POWERFUL we housing advocates are when we speak up and act together. It’s because of our collective action and advocacy that the Document Recording Fee bill came back from the dead last session, remember! We were a sea of 650 people wearing red scarves, red shirts, red hats, and many people wore our One Night Count ‘3772’ and Student Homelessness ‘32,494’ buttons. Even as folks dispersed into their legislative district groups, we were unified and unmistakable throughout the halls of the Capitol. Each button and scarf quietly communicated a strong message of solidarity and the importance of these issues. In addition to the work we do to recruit and transport folks to HHAD, we at the Coalition have the distinct pleasure of also delivering over 1,100 One Night Count advocacy postcards to legislators who represent parts of King County. Hillary and I had great conversations with many Legislative Assistants, some Legislators, and plenty of the helpful staff at the Capitol. There’s enough energy, passion,and community at HHAD to recharge and reignite our commitment and resolve to take action and make change. Thank you to each and every person who participated! HHAD is but one day a year – and a great day at that – and the other 364 days are just as important. Whatever the method, make sure your legislators hear from you, and hear from you often. Every call, email, letter, and in-person visit throughout the year is what builds and sustains the momentum we need to make positive change in our communities and across our state for people who are homeless and unstably housed. Thanks for all you do to speak up! October Budget Hearings: Make your voices heard! Now that the Seattle Mayor, Ed Murray, and King County Executive Dow Constantine have proposed budgets to their perspective councils and the public, it is that time of year again to organize and advocate for important causes on both the King County and Seattle City levels. During the month of October there are SIX opportunities all over the county to meet with council members and share your opinions about what is important and should be included in the budget. We would love to see ALL of our members join forces together to show the Coalition on Homelessness’ dedication to our community by having a large presence at every Budget Hearing. We want to hear from you if you are coming! Contact us at rsvp@homelessinfo.org or call our office at 206-204-8350. On Monday Mayor Murray proposed his budget to a roomful of people, including many of the participants of our Homeless Youth Advocacy Summit who were excited to be part and are enthusiastic about joining us at future budget hearings this October. Youth and Young Adults Committee Recap from August 12, 2014 Meeting — Take Action! Thanks to all who came to the Youth and Young Adults Committee’s (YYAC) August meeting! Folks from Teen Feed, YouthCare, Youth Undoing Institutional Racism (YUIR), End the Prison Industrial Complex (EPIC), New Horizons, Seattle Youth Ministries (SYM), Youth Housing Connection, Auburn Youth Resources, Seattle/King County Coalition on Homelessness, and ROOTS joined to discuss and plan the upcoming Youth Advocacy Summit, a project of the YYAC. 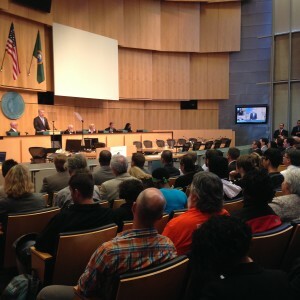 Be sure to mark your calendar for the Summit: September 22-23, 2014 from 8:30 a.m. – 4 p.m. at Seattle City Hall’s Bertha Knight Landes room. Support active and informed participation in democracy to make sure that Everyone Counts! TAKE ACTION! 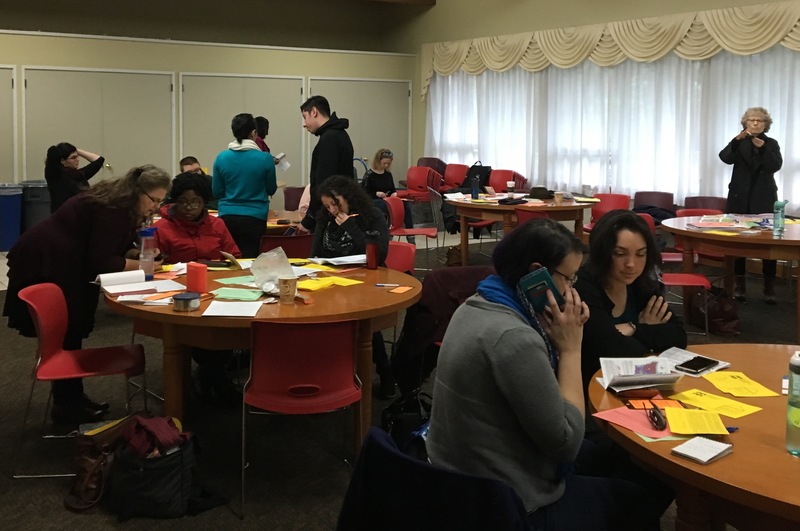 As members of Coalition’s Youth & Young Adults Committee, your role is to work with youth participants to shape the summit, and to connect it to on-going advocacy and public education about Seattle and King County budget processes. As staff, we need your help to recruit and train peer leaders to help with facilitation, and support young people in communicating effectively about their issues to local elected officials and government staff. HELP RECRUIT PEER LEADERS: Download and share the 2014 Youth Summit_Peer Leaders Recruitment Flyer to help recruit peer leaders. HELP RECRUIT PARTICIPANTS: Download and share the 2014 Youth Summit Flyer to help recruit participants and spread the word! Additionally, we need your help to secure food donations and contributions for the two-day event. Contact (Rebecca) at rebecca@homelessinfo.org for more information. Have a place in mind? We’re created this letter template for your use: 2014 Food Donation Solicitation Letter_YouthSummit. We were also joined by representatives from YUIR/EPIC, who shared important information about the No New Youth Jail campaign. As brief history, an initiative passed in 2012 to create a youth jail in the Central District of Seattle. YUIR believes that this isn’t the right path for our community, for youth, or for folks of color who are disproportionately represented among those in jail. YUIR’s motto is ‘Prevention, not Detention.’ Their next action is a silent protest on Sept. 2 at 12-noon at the King County Council Building — plan to attend and please do share their No New Youth Jail_ Silent Protest flyer. To get more information, contact James Williams: 253.883.9548; jamesatdu@hotmail.com. Hatlo shared information about Queer Youth Network’s upcoming meeting. Check out this flyer for information about what QYN is, when they meet, and how to get involved: 2014 Queen Flyer_Meeting Dates. Please join us at our next meeting – the last before the Youth Summit – on Tuesday, September 9, 2014 from 10-11:30 a.m. at the Capitol Hill Library.